The National Hospice Service Program was inspired by personal experience, when Mr. Li Ka-shing witnessed the intense suffering of a friend, who was hospitalized with terminal cancer under the best care in Hong Kong. As his friend was still tormented by his illness, Mr. Li was deeply moved. He thought of the countless patients in mainland China who suffer from the same illness, and that if those patients were poor, their pain would be much harder to bear. As a result, he then started discussions with the Shantou University Medical College about setting up a hospice in mainland China. To make it more acceptable to Chinese society in general, Mr. Li named this "Ning Yang Yuan" which, in Chinese, means a sanatorium that is filled with peace and serenity. "I am in the same boat as you all, since we want to serve the helpless to the best of our ability. This program is not for a year, but to continue until our country is more affluent and can look after the impoverished cancer patients. My support to education and healthcare will exceed my lifetime. Cancer patients have contributed to the society, we hope that the last part of their life journey can be less agonizing and more dignified." 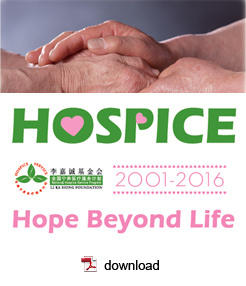 November 18, 1998 was a special day for hospice service in mainland China as it saw the opening of the first Hospice Unit, founded by Li Ka Shing Foundation (LKSF) to provide free home-based holistic care for patients with terminal cancer. This Hospice Unit at Shantou University Medical College-affiliated First Hospital proved to be a feasible model for mainland China where 19 additional Units were added and then the National Hospice Service Program was launched in 2001. All hospitals where the Hospice Units are based match the LKSF's donation by providing healthcare professionals and facilities. At the end of 2018, 38 Hospice Units were established, more than 30 Units currently in operation, distributed in 32 cities of 27 provinces in mainland China, covering over 350 districts and counties. A total of over 194,000 patients have been served. The LKSF has thus far supported the Program in mainland China with 690 million RMB. The annual budget is 52 million RMB to help about 16,000 patients. Each Unit has at least 2 physicians, 2 nurses, 1 social worker, 1 driver, 1 clerk with a designated car. Each Unit has a separate section consisting of sitting/waiting area, consultation room and staff office. LKSF donates 1.4 million RMB to each Unit per year. The Program is managed electronically at the Program Office in Shantou University Medical College. This comprehensive system allows easy overview of patient data, medication prescribed, service provided, and expense incurred. All Hospice Units are expected to follow the "Guidelines for Hospice Unit Management" put together by the Program Office which oversees the quality of hospice service through regular patient phone survey. An evaluation of more than fourteen thousand patients revealed that 92.7% of our patients had their cancer pain reduced at least 60% after the medications; 98.10% obtained financial relief whilst 98.2% the psychological pressure was eased; 97% of the patients were satisfied with services provided by our hospice units till the end of Dec 2018. To maintain and improve our service quality, all hospice units have been evaluated by consultants from an international third party assurance company, with on-site formal ratings and assessment to help endorse our management guidelines from 2009 to 2012. We perform on-site quality assurance evaluation of all hospice units once every three years from 2013. Many pamphlets containing information about medication usage, possible side-effects and its management, nursing care, etc, have been distributed to patients and families. Public education on proper perspectives and attitude towards death is conducted through multiple media. It is hoped that through communications and support groups, the fear of talking about "Death and Dying" in the Chinese culture can be minimized if not dispelled. To ensure delivery of quality care, colleagues from all our Hospices meet twice a year for experience-sharing and continuing education. Overseas experts in the field bring them up-to-date with recent advances in hospice care. In addition, caregivers in the program have the opportunity to visit similar centers in Taiwan and Hong Kong. Videoconference facilities have been used to promote continuous training and communication among the Program Office, overseas experts and all hospice units together at real time since 2010. All staff participated in case study or training programs through videoconference facilities twice a month. Through the dedicated efforts of many colleagues in the Program, the first edition of a textbook on "Palliative Medicine - Care in Terminal Cancer" was published in 2008, and the second edition in 2013. While a few medical schools/universities with a hospice unit have made "Palliative Medicine" an elective subject for undergraduates, we hope more schools/universities will follow. Over seventeen thousand students from 16 medical schools/universities where the hospice units are based enrolled in the course of “Palliative Medicine” since 2008. The spirit of hospice service has attracted an ever-increasing number of volunteers, who help with non-medical chores such as housework, shopping, tutoring children of Hospice patients, keeping patients company or take them for short excursions. More than 20,000 volunteers have participated in our program, and 81% of these have been university students. The first team of medical student volunteer was formed in Shantou University Medical College in 2002. Since then, about 1,800 have followed their footsteps each year in the College. Becoming a hospice volunteer has enabled the students to put into practice their responsibility and care for the disadvantaged in the community. The role model of the Hospice field workers has also helped to nurture and impart a humane attitude to the future doctors. The social worker in each hospice unit has been assigned to help coordinate the volunteers. A "Hospice Volunteer Development Handbook" was also prepared by the Program Office to facilitate this effort. According to GLOBOCAN (2018) report, there were 18.1 million new cancer cases, 9.6 million cancer deaths worldwide. An estimated 4.292 million new cancer cases and 2.814 million cancer deaths occurred in China in 2015 (Chen W, Zheng R, Baade P etal. Cancer statistics in China, 2015. CA: A Cancer Journal for Clinicians 2016;66:115-132). Although LKSF has already served many cancer patients in the last decade, Mr. Li believes that our service is inadequate to meet the great needs. He hopes that the program will create a ripple effect in the community. A few similar hospice care units recently set up by other philanthropic individuals/corporations have realized this wish. Hospice Care is a relatively new concept in mainland China where talking about death is still a taboo. The issues and challenges that we currently face include lack of recognition of palliative medicine as a medical sub-specialty in mainland China, severe shortage of hospice healthcare workers and insufficient funding. To have palliative medicine obtain recognition and eventual approval as a medical sub-specialty by the Ministry of Education and the National Health Commission of the People’s Republic of China (formerly Ministry of Health) is an important task for the future. This will help enhance the well-deserved status of the involved healthcare professionals, and raise the standard of hospice care in mainland China. © hospice.com.cn All Rights Reserved.